When artist, author and speaker Amber Rae was living in San Francisco, she had a good job in tech, an apartment full of furniture, and a nice car. But something was wrong. She was a career success but had the career success of someone else’s life. Something was holding her back from the life she really wanted. Instead of pursuing what she really wanted, Rae succumbed to eating disorders, Adderall abuse, and half-hearted commitments that left her unhappy and seeking answers. Even when she finally made a daring break to move to New York to follow her dreams, Rae gave up at the first offer of a secure job even though it wasn’t what she really wanted. Then after moving on to start the Bold Academy to help young entrepreneurs find their own success, she still felt like a failure. That’s when Rae realized worry had been holding her back from the life she wanted and wonder had been driving her towards her goals. If she could learn to deal with the worry and seize the wonder, she could fully pursue the life she wanted. In her book, Choose Wonder Over Worry, Rae shares her personal journey from being stuck in her own comfort zone to battling the myths and fears that prevented her from living the life she wanted. Drawing from her personal stories, her hope is to inspire leaders, entrepreneurs, and people who feel stuck that change is possible; then offers exercises to help readers overcome their own worries, live with their feelings, and find a way to identify the life they want. According to Rae, people spend too much of their lives doing the wrong kind of worrying. While “useful worry” helps you focus on problems that are within your control, it is the toxic worrying about things out of our control that holds us back and stunts our growth. The first step to overcoming your toxic worry is to first identify if your worry is a toxic worry. Rae suggests you ask yourself two questions when examining any worry: 1) Is this a real possibility? 2) Is there any productive action I can take right now? If you answer no to either question, then you have a toxic worry. To help you get over your toxic worry, Rae offers journal exercises for you to discover the myths that are holding you back from your goals and offers Wondervention exercises to help you find the answers to choose your right direction. For example, she asks what you would do if success or failure didn’t matter, or what you are afraid of and what your future self might say of this fear. By reading her story, using the journaling prompts, and completing the Wondervention exercises, Rae hopes to motivate leaders, entrepreneurs, and others seize the life they really want today so they won’t regret tomorrow. 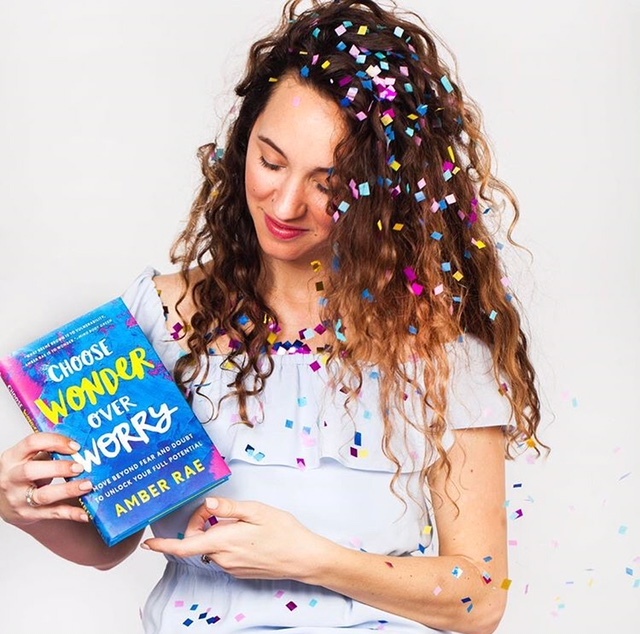 To meet and greet with Amber Rae and pick up a signed copy of Choose Wonder Over Worry visit her on her book tour.